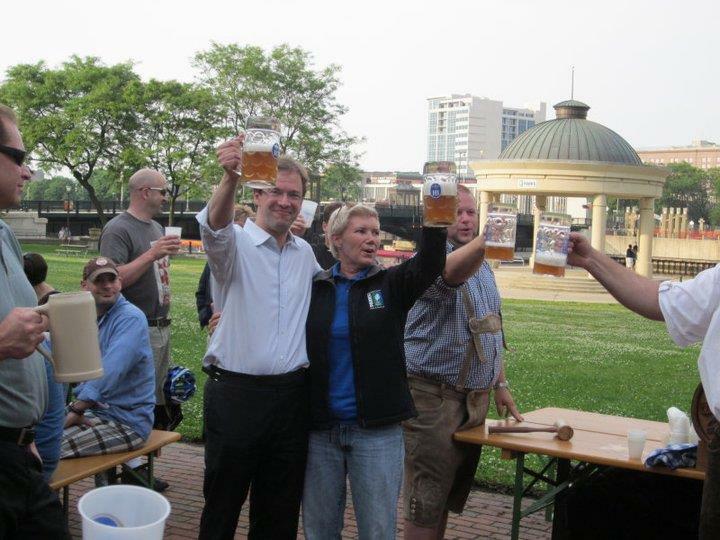 Milwaukee County Executive Chris Abele and former Milwaukee County Parks Director Sue Black in 2011. A huge list of Milwaukee County parks, 43 in all, could be sold by Milwaukee County Executive Chris Abele under a state law passed last year because they are not zoned as parkland by the municipality where the parks are located. Under the law, Abele needs only the sign-off of either the Milwaukee County Comptroller or a real estate professional appointed by the Milwaukee County Intergovernmental Cooperation Council and any of those parks could be sold. Supervisors voting for the resolution were: Deanna Alexander, Gerry Broderick, Eddie Cullen, Jason Haas, Marina Dimitrijevic, and Peggy Romo West. (Anthony Staskunas was excused.) The full board will address the issue this Thursday, February 4. The 2015 state budget bill (Act 55) granted Milwaukee County’s executive the power to sell county land without board approval. Only property specifically zoned a park is exempt. But as it turns out, about 26 percent of total land in the county’s 156 named parks lack such zoning. Those parks comprise an estimated 3,932 acres, according to Preserve Our Parks president John Lunz, who testified before the committee. That includes many of the county’s largest and most popular parks: Brown Deer, Doctors, Estabrook, Grant, Lake, Lincoln, Sheridan and Whitnall. Smaller but heavily-used parks also not zoned as parkland include Juneau overlooking the lakefront, downtown’s Cathedral Square and Pere Marquette Park and Milwaukee Rotary Centennial Park, recently created through the efforts of the Urban Ecology Center. Paul Bargren, county corporation counsel, confirmed to the committee that land in all 43 parks could be sold, but added that he doubted that was “the intent” of legislation Abele succeeded in getting passed. Baldauff says Abele was not aware at the time of the discrepancy in zoning of these parks. The deal giving Abele more power over land sales than any county executive in the state was requested by him and approved by legislators with a key goal in mind: to make sure the county board couldn’t vote down Abele’s sale of county land to the Bucks owners (at a cost of just $1), who saw the land as crucial to their new arena development. But several supervisors at the meeting said they were suspicious of Abele’s intentions based on his repeated efforts to sell downtown’s O’Donnell Park, originally to Northwestern Mutual, which the board voted down, and later through a proposed open-bid process for the park that the board also rejected. Supervisors also noted that Abele had gotten language placed in the state bill to specifically allow a sale of O’Donnell Park, which was not named but identified more stealthily based on the geographic boundaries of the park. That provision was eventually deleted from the bill. Dimitrijevic suggested it might be easier to simply ask the state legislature to repeal that clause. She noted that getting independently elected representative of 19 municipalities to change their zoning could take “months or even a year.” She noted that those cities and villages are under no obligation to change their zoning codes. But Dimitrijevic charged that as things stands now, deals could be made regarding any of these parks, which would be completely beyond the board’s purview. It seems “condescending” for the board to be asked to “just trust that everything’s going to be just fine,” she contended, given recent actions by the administration regarding parks. John Dargle, director of the county parks department, told the committee his staff continues to vet the list of county park land, which includes more than 900 parcels “across the spectrum.” That includes land classified by the department as open space, floodway or agricultural land, and which is not listed on the county’s website, which only includes named parks. Committee members requested that Dargle provide more complete data about all parks-operated lands that could be subject to sale, including an acreage tally of named parks and other land, percentage of each park specifically in jeopardy and the zoning designation of each park or parcel). Dargle explained that all municipalities have zoning codes but not all have “park” as a category. “For example, instead of assigning Park zoning, some communities use Conservancy, Agricultural, Floodway, or Institutional zoning districts for parklands,” he noted in a slide show. Dargle said that other factors could affect whether parkland could be sold or redeveloped. They include deed restrictions prohibiting usage other than as a park, conservation easements restricting future use, management agreements and leases, historical designations, environmental conditions such as wetland and floodplain regulations, and existing parks-and-open-space plans. The Republican evil-doers now in control of Wisconsin’s legislature have turned it into Dr. Frankenstein’s Laboratory. They have unleashed a little monster–with new super-powers–in an unholy effort to stick it to Milwaukee County. The rich–but unfortunate–little monster is Christopher Seton Abele, poorly disguised by his occasional Democratic rhetoric . Like Frankenstein’s monster, the Republicans’ Abele intends to wreak havoc in his confused zeal to “achieve greater efficiencies” as Milwaukee County Executive. Besides the gurgling possibility of park sales, what other unfathomable consequences will rear up from Legislative Act 55 provisions, which gave Abele–a petulant man-with-issues, unprecedented control of Milwaukee County? Milwaukee County parks, the zoo, the airport, the bus system are all just toys to break, discard or sell. This spoil brat thinks he should run everything. Shamefully, his alliance with Wisconsin Republicans has made it all possible. Was it a “Thank you!” for Abele’s contributions to their campaign funds? May Gold have mercy on Abele’s plutocratic soul. 1. I don’t want to sell park land. 2. If I should see a compelling reason to do so, I would put it up to an up/down approval vote by the Milwaukee County Board with appropriate hearings and public comment. 3. I will ask the state legislature to repeal the changes to the state law. Of course, any member of the State Legislature can propose the rollback of the anti-democratic state laws. The Milwaukee delegation should take a lesson from our history, like Vell Phillips, they should reintroduce their righteous legislation until sensible change comes to Madison. Abele does not do enough to reject state-imposed executive powers that weaken local autonomy and democracy while Senator Larson keeps promising things to Milwaukee County citizens best delivered from his current legislative post. Put Executive Chris Abele back in philanthropy and keep Senator Chris Larson in the State Senate. Vote for Joseph Thomas Klein for Milwaukee County Executive. I trust Chris Abele has already notified municipalities of this potential SNAFU and what needs to be done to protect the parks. I’ve attended meetings in Cudahy and St. Francis in the past 20+ years. The most notable was the St. Francis meeting when they were debating the County’s opportunity to purchase the swath of land owned by then Wisconsin Electric along the lakefront. The City objected because it was too valuable of real estate and needed to be developed. The later occurred. Cudahy meetings salivated at the chance to do the same. The problem is not what the County Board and Executive might do, rather at the local level in an attempt to increase the tax base for some very valuable real estate along the southern lake shore county park system. Sounds like we should be beating the drums at the County Board who was incompetent enough to not zone these parks as actual parks. Not at Abele who won’t actually sell them. Nice County Board deflection though, trying to blame Abele for their stupidity. @Ryan N The County Board doesn’t play any role in zoning. The individual municipalities do. And in fact some munis don’t have a “park” zoning code. Well, if we don’t sell the parkland for cheap housing, where will we put the favelas of the Walker-Abele feudal state?